What makes the Founder's reading list so curious, is not so much the inclusion of books Rand liked, but the inclusion of books Rand didn't like. Hence, we find Tolstoy's Anna Karenina, which Rand regarded as the most evil novel ever written; and we also find the inclusion of Theodore Dreiser, an author whose writing Rand regarded as no more competent than that of a typical high school student. Why the inclusion of books Rand didn't like? Some might think it's an attempt to give the devil his due; or maybe merely a way of trying to prove that Founder's is not a slavishly Randian institution after all. However, there is a much easier explanation. The reading list includes books Rand didn't like because these are books that Rand mentioned, and the individual who is most likely responsible for that list, Gary Hull, is a notorious intellectual light-weight who probably has never read at least half the books on his list. After all, it was Hull who, at a party some twenty years ago, expressed credulity at the size of von Mises' books, saying, in effect: "How can anyone read books that are so long!" Hull choose books mentioned by Rand because he had no other way of figuring out which books are important and which aren't, since his reading is so limited. The trouble is, of course, that some of the books Rand mentioned but disliked are not terribly important. Sinclair Lewis is a fine writer, but he's not a major figure worthy of study in a college literature course. Thomas Wolfe was an immensely talented writer, but his work is excessively narcissistic and, if the truth be told, a disaster for American letters. John O'Hara is a minor figure almost entirely forgotten today. As an additional problem, there are all those books that Rand never mentioned yet which certainly are important—or at least more important than the works mentioned above. Rand seems to have confined reading to classics that she like (or happened to read while attending school in Russia) or early 20th century books. She seems to have known very little (or at least she never mentioned) the lion's share of eighteenth and nineteenth century English and American literature. She never mentioned in print Fielding, Austen, the Bronte sisters, Thackery, Trollope, Dickens, Melville, James, Crane, Eliot, Meredith, Hardy. Major Twentieth century figures she wrote nothing about include Conrad, D. H. Lawrence, Waugh, Faulkner, and Bellow. She also some gaping holes in French literature: Stendhal, Maupassant, Proust, Gide, Giono, etc. etc. The real issue we have people who are not well-read trying to set up a Great Books curriculum, and that just doesn't, nor can it ever, work. Worse, such a curriculum is, in a deeper sense, at odds with Objectivism itself, because any student who read and absorbed and understood the best that has been thought and said during the course of Western Civilization could not possibly remain an Objectivist. What makes great books great is their ability to describe and illuminate the great insights into human nature and the human condition. Yet it is precisely these great insights that Objectivism tries so very hard to ignore or deny! "Those who want to read Founders as an "Objectivist college" are doing an enormous disservice to our students. That is not our stated goal, nor is it my goal as a professor. To those who have raised bizarre and irrelevant criticism of Founders, based on nothing but their own bias against Ayn Rand's ideas, I would recommend that you study the fallacy of the Argument from Ignorance." Despite these and other embarrassing contradictions of Dr Garmong's claims, neither Dr Garmong nor the College's PR firm have responded to our requests so far for elaboration. The principals at the controversial new Founders College have been at considerable pains to deny any ongoing Objectivist connection to, and influence at, the College. Gary Hull, the long time Ayn Rand Institute speaker who founded the College, claimed the original plan of an Objectivist College "fell by the wayside." Founders CEO Tamara Fuller said the Ayn Rand connection "distracted" people and claimed that the college "never intended to teach Objectivism." Most recently, Founders Professor of Philosophy Robert Garmong wrote to this blog calling such criticisms "bizarre and irrelevant" and "based on nothing but...bias against Ayn Rand's ideas." He also recommended that those who raised such issues - presumably us included - "study the fallacy of the Argument from Ignorance." Founders College       "What Ayn Rand Read"
The Scarlet Pimpernel    "A...fiction hero loved by Rand"
We do not consider our above references are complete, and welcome any additional connections readers might note. However, what is astonishing is the sheer slavishness with which Ayn Rand's personal and often eccentric literary tastes have been followed by a College publicly purporting to offer a broad, objective (as opposed to Objectivist), liberal curriculum to its students. However, remarkable as this is, it seems Founders College's Drama curriculum even manages to outdo the Novels course in intellectual forelock tugging. A comparison here shows that Founders Drama course has been lifted bodily from Ayn Rand Institute head Leonard Peikoff's "Eight Great Plays," along with a couple of firmly Ayn Rand-approved extras and of course a couple of Rand's own plays. Founders College      "Eight Great Plays"
Founders Drama cont. "What Ayn Rand Read"
Founders Drama cont. Other ref. Once again we have an almost perfect match, with the only exception being Aristophanes "The Clouds" from Founders list (Aristophanes is however lectured on by the Ayn Rand Institute's Robert Mayhew, so presumably he is approved). One also notes that Ayn Rand, a minor playwright even by the most generous standards, gets no less than two plays in Founders drama curriculum - one of which, "Ideal" was never even produced. Shakespeare, or George Bernard Shaw, by comparison, only get one. 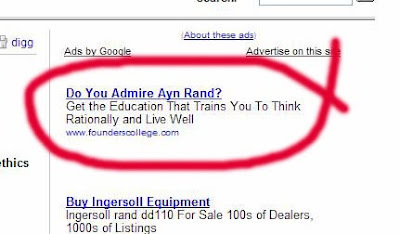 So despite the strong claims of the college's principals, it seems that once again the parallels between Founders, Objectivism, and the Ayn Rand Institute are all too obvious. So far I have emailed Professor Garmong inviting him to answer some direct questions about his claims, but he has not responded. I have also emailed Founders College's PR company seeking further contact information. They have also yet to respond. Certainly as far as Professor Garmong is concerned, it seems it is he himself who is either "ignorant" of his own College's stated curriculum, or is misrepresenting it. We also note that Bryan Niblett, Dean of the Faculty and teaching Writing and Literature is one of the staff who does not appear to have any overt connection to Objectivism or the ARI to date. We would be most interested in Professor Niblett's comments on the subject. "I am the philosopher hired by Founders to teach the introduction to philosophy courses, so I believe I have some standing to comment on this school. As long as I am at the helm of the Founders philosophy department, students will be educated on the major ideas behind the Western tradition. ALL of the major ideas, not just Objectivism. Before you assume that my personal adherence to Objectivism will lead Founders to a bias in favor of Objectivist ideas, please do me, and Founders, the honor of checking the readily-available evidence of my fairness as a professor and a grader. There are plenty of sources available out there (e.g., pickaprof.com, ratemyprofessor.com). You might also wish to check my statement of teaching philosophy, as outlined on Founders' site. Founders College will not hold adherence to Objectivism as its standard of right and wrong, not as long as I am involved with this enterprise. Founders expects its students to be prepared to discuss all of the philosophical tradition. Those who want to read Founders as an "Objectivist college" are doing an enormous disservice to our students. That is not our stated goal, nor is it my goal as a professor. Mr Garmong is referring to coverage of Founders College on this blog (here, here, here) and elsewhere (subscription required) over the past few weeks. 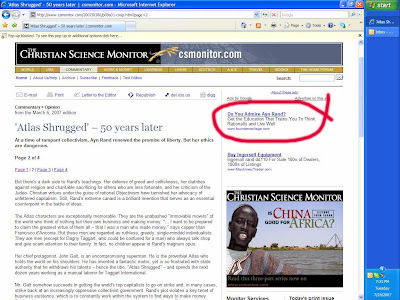 Once again, claims such as Mr Garmong's above seem to clash with both the historical origins of Founders - it was started by by The College of Rational Education Inc. in 2005, which by its own description exclusively applies Ayn Rand's philosophy to all its undertakings - and its current staff composition, which is composed of at least 50% dedicated Objectivists (the Chronicle of Higher Education article underreports this figure). Further, much of the course descriptions and surrounding rhetoric have a strong Objectivist character - for example, the Literature reading list. Thus, it is hardly "bizarre" and "irrelevant", as Mr Garmong writes, to raise these issues. Rather, it is a reasonable conclusion that is consistent with the facts so far. Given the vague and even murky nature of Founders origins and mission - even CEO Tamara Fuller says on an Ayn Rand related site, there's been "a lot of mystery" surrounding it - it would be helpful if Mr Garmong was willing to answer a few direct questions. If he is, he could email me at estigon2001atyahoodotcodotnz for a short list. I will be happy to publish his answers in full. This is a very apropos point to the ARCHN thesis; that Rand's philosophy cannot account for, and indeed ignores, basic facts of reality, such as biology. Elsewhere Stoddard, who appears to have a generally favourable view of Rand, contributes a thoughtful criticism of her ethics, pointing out the important inconsistencies between her philosophic positions and her fictional examples, and suggesting how her work might be more usefully interpreted - he suggests personal "legacy" as a promising grounding for ethics. We at ARCHNblog agree, incidentally, that Rand is far more inconsistent and contradictory as a writer and thinker than she is portrayed to be by her followers. Wider recognition of this fact is necessary, I think, before her work can be usefully discussed. As covered by ARCHNblog over the last week, the latest Chronicle of Higher Education now carries (subscription required) the Founders College/Objectivism connection in some detail, wittily calling it "Gary's Gulch." While the CHE notes the Ayn Rand Institute orientation of founder Gary Hull and Philosophy Professor Robert Garmong, and that Art History Professor Lee Sandstead is an Objectivist, it has overlooked that Business Professor Steve Gedeon is also an Objectivist, and that both the latter also have ARI affiliations. (It is unlikely that the CHE would know much about the significance of this in Objectivist politics). The CHE also overlooks that, contrary to claims of the college's ideological neutrality, ARI-friendly Objectivists make up at least 50% of the faculty announced to date. In the latest twist in this somewhat murky saga, the CHE semi-confirms what an anonymous commenter suggested here a few days ago: "More surprising than Founders' public move away from objectivism (sic) is that Mr. Hull has largely cut his ties with the institution. He remains a shareholder in the founding corporation and will serve as a consultant to the college, but Ms. Fuller says he will not have a role in day-to-day operations." This, however, seems to still clash with the statement on Founders website from March 14 that since stepping down as CEO, Founders' founder Hull has the role of "Chief of Educational Research and Development with responsibilities for cultivating the faculty, developing the curriculum and teacher training, and maintaining the highest level of academic standards." "'It's his personal choice,' (CEO Tamara K. Fuller) says, declining to elaborate. Mr. Hull has been mum, not returning repeated calls and e-mail messages from The Chronicle over a six-month period." The CHE report also mentions that scholar Eric D. Daniels "has also backed out of the venture" and that he, like Hull, is also mute, saying only, "I am not and will not be involved, and have not been for about a year." The CHE does not mention the fact that Daniels is another ARI-friendly Objectivist. However, the CHE does mention that "Mr. Daniels taught in Duke's Program on Values and Ethics in the Marketplace, which Mr. Hull directs. It is one of several programs supported by the BB&T Charitable Foundation, an arm of a financial-services company whose chairman and chief executive officer, John A. Allison IV, describes himself as an admirer of Rand." This turns out to be yet another ARI connection, as ARCHNblog notes that John A. Allison IV is a "major contributor to the Ayn Rand Institute." While an official relationship between the ARI and Founders does not seem to exist, given the accumulation of clear yet less formal relationships between Founders and the Ayn Rand Institute, it seems difficult to countenance claims that there is "absolutely no connection." "But even before the doors open, Mr. Hull's dream looks like it's beginning to crumble. He has backed out of the project's day-to-day operations, the college's chosen accreditor is in hot water with the government, and enrollment has fallen far short of the 140 students the college hoped to open with in September....The college has reduced the anticipated size of its first class from about 140 students to between 15 and 20. Ms. Fuller plans to supplement the college's revenues by continuing to operate an inn on the South Boston property and by building a retirement and lifelong-learning community nearby. To float the enterprise, Ms. Fuller and several anonymous investors have put up $10-million, according to documents submitted to the state council. The investors have also taken on $17.1-million in debt, according to the documents, including the purchase of a former plantation, with a 160-year-old mansion, for a campus....The campus also has a spa, swimming pool, a Doric-columned mansion, crumbling slave quarters, and, according to local lore, no fewer than 30 ghosts. This fall the ghosts may outnumber the students. So far, just 10 have enrolled." I've now updated my original post below about Founders College, as some anonymous commenters were claiming that there is "absolutely no connection" between the college and the Ayn Rand Institute. In fact, as my update confirms, at least 50% of the faculty to date are committed Objectivists with obvious ARI orientation. Perhaps our commenters are not aware of this. Or alternatively, the apparently Objectivist orientation of the college (it is the "brainchild" of long-time ARI speaker Gary Hull) is not perhaps considered helpful in the marketing of the college to the wider community (one commentator accused us of trying to "marginalise" the college by exploring this connection). As Greg Nyquist remarks in comments,"the Objectivist view of education, as expounded by Leonard Peikoff, is actually one of its least objectionable theories. The practical sum of it is little more than the Great Books with the eccentric addition of Rand's reading list," and futher,"given how bad so much American college education actually is, this would be an improvement for most students." I would tend to agree, with the caveat that this would depend on just how, for example, the literary list at Founders is taught - whether it would strongly reflect Rand's particular artistic opinions or not. This is not clear at this stage. Why anonymous commenters would so strongly seek to deny the college's connection with Objectivism and the ARI, when this is obviously the case, is also not clear. "There are other questions about the college. Its license application says Founders College will be operated by The College of Rational Education Inc., a nonprofit corporation in North Carolina. According to papers filed with the North Carolina Secretary of State's office in March 2005, The College of Rational Education "shall be exclusively operated as to provide a reality-based, rationally grounded education, by applying Objectivism, the philosophy of Ayn Rand, to all of the Corporation's activities and undertakings." Hull is quoted as saying that this idea "fell by the wayside." The story also adds that according to Hull, as with anonymous commenters here, that "there is no connection between Founders College and any particular philosophy or outside organization such as the Ayn Rand Institute, for which he has written articles." However, Hull's claims, which date from almost a year ago, seem contradicted by reality. The fact is that at least 50% of the current faculty of Founders are longstanding Objectivists with some form of ARI connection. Further, while not much is yet clear on the content of Founders courses, what few specifics are evident - for example, the Literature course reading list - is highly suggestive of orthodox Randian influence, and guest lecturers include self-described Objectivists such as psychologist Dr Scott Adams and ARI writer Andrew Bernstein. Much of the Founders site's writing echoes Objectivist rhetoric. Finally, with its $12m campus and "fine dining" facilities it is clear there is some serious money behind it, if not clear exactly whose. Thus the situation, like so much else in the ever-shifting world of Objectivist politics is murky. Founders seems to have started out with a strong Randian direction, but this has been diluted; possibly in the face of marketing realities, either reluctantly or strategically. The downside of this dilution is what seems to be increasingly strong criticism of the project and Hull personally from some sections of the Objectivist community. Perhaps Hull's decision to leave Rand to fall "by the wayside" - at least in his publicity - has also compromised his standing to some degree with the ARI. Nonetheless, despite Hull's claims, there remains a strong Objectivist, and indeed ARI flavour to the Founders project. Unless there is another schism in the works - something that is always a possibility - this seems to be the underlying direction the college is taking. The article by John Lewis outlining the Objectivist plan to defeat Islamic Terrorism linked in Daniel Barnes' post below provides such a superb example of what is wrong with Objectivism that I can't refrain from commenting on it. By attempting to view the world through the prism of Rand's philosophy, Objectivists are unable to appreciate and grasp the complicated web of critical factors making up a given situation. Not surprisingly, the first thing Objectivists get wrong is human nature. Lewis begins his screed by paraphrasing Thucydides: "Even though circumstances may change, human nature remains the same; and certain human elements—especially moral and psychological factors—are at the root of all wars." Lewis is here off to an auspicious start, much better than one would expect. Thucydides was a very wise man who understood human nature and, for that reason, grasped the motive forces of history. But Lewis immediately distances himself from Thucydides' wisdom by adding: " We can disagree with Thucydides about the identity of those factors, and reject his pessimistic view of human nature..." The question, however, is not whether Thucydides' view of human nature is pessimistic, but whether it is right. And if the course of human history is anything to judge by, Thucydides is in fact right. That is why he is still read nearly two and half millenia after his death. History is clear [writes Lewis]: All-out force against fanatical killers is both practical and moral. It led us to our two most important foreign policy successes—the defeats of Germany and Japan in 1945—and to the permanent peace with those nations that we take for granted today. Such a course was practical and moral then, and it is practical and moral now—an affirmation, and a defense, of life and civilization. This is an example of foreign policy dictated by ideology. James Burnham defined ideology as “a more or less systematic and self-contained set of ideas supposedly dealing with the nature of reality (usually social reality), or some segment of reality, and of man’s relation (attitude, conduct) toward it; and calling for a commitment independent of specific experience or events.” That, in a word, is what is wrong with Lewis' analysis: it insists that we follow strict, inflexible principles regardless of the specific situation at hand. If we do a little simple analysis, applying intelligence and good judgment to the predicament faced by the United States and the West, we will quickly discover how absurd and misguided Lewis really is. Lewis wants us to give the Islamic world, particularly Iran, an "ultimatum" demanding "unconditional surrender." "When the enemy balks at the ultimatum," he counsels, "atomic bombs are dropped on his cities." Now let us consider what would happen if the U.S. attempted to follow this policy. In the first place, a nuclear attack on Iran would so horrify the rest of the world that the United States would find itself entirely isolated. We would almost certainly lose all our European allies, including Great Britain, and, even more critically, we would lose access to the oil in the Middle East. The social turmoil in the Islamic world caused by a nuclear strike against fellow muslims would force the leadership in Saudia Arabia and other oil producing countries to boycott the U.S. And even if (per impossible) no boycott occurred, the oil infrastructure in the Middle East is so fragile that even a nuked Iran could knock it out, especially given all the support they would get from muslim sympathizers in oil producing countries. Lewis, guided only by his simple-minded ideology, is under the illusion that the President Bush refuses to attack Iran because he is a pragmatic altruistic. This is nonsense. The United States has not attacked Iran for the simple reason that such an attack would pose a serious threat to the oil supply from the gulf. If that supply is cut off, the United State's economy -- indeed, the entire global economy -- would experience a serious downturn that could have catastrophic social and political consequences in the West. The turmoil here in America could be so dramatic that the government, just to get by, might very well have to declare martial law. Lewis has absolutely no appreciation for how complicated the real world situation actually is, nor does he have a clue how many factors are involved in judging what would happen if the U.S. pursued the policies he and his Objectivist cohorts advocate. To take just one example, has he or anyone at the Ayn Rand Institute kept eye on the financial situation in the world? Does anyone there understand the extent to which banks in the United States, prompted by the Federal Reserve and an irresponsibly deregulated banking system, have extended credit and expanded the U.S. money supply? It's not clear that it would take much to bring the entire economy down, with our over-leveraged asset and real estate markets, and mountainous piles of debt ubiquitous throughout the whole system. There are very compelling reasons explaining why the U.S. has not bombed Iran. It is not currently a viable option. In the real world of fact, rather than the imaginary world of Objectivist ideology, there are oftentimes no easy solutions. Not all problems are soluble, even if we apply Objectivist "reason" to them. Life is tough. To try to evade this by describing it as "pessimistic" or the "malevolent universe principle" is merely to place one's head firmly in the sand. But, as Thomas Carlyle reminds us, "No Ostrich, intent on gross terrene provender, and sticking its head into Fallacies, but will be awakened one day,--and in a terrible a posteriori manner, if not otherwise!" Ideology is almost always about evading hard facts. 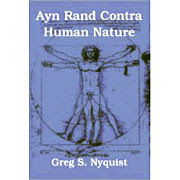 Part of the appeal of Objectivism is that it provides an over-simplified view of the world that explains all the ills of mankind as due to a failure to follow "reason," which in concrete terms means: a failure to follow Ayn Rand, a woman with no particular expertise or insight into human nature or the human condition and whom von Mises once described, so exasperated was he by her intransigent bullying nonsense, as a "silly little Jewish girl." The Ayn Rand Institute looks like its got its very own university, Founders College, kicking off this year. Victor Hugo, Dostoevsky, Ayn Rand, Nathaniel Hawthorne (especially The Scarlet Letter), Quo Vadis, Tolstoy (esp. Anna Karenina), Walter Scott (esp. Ivanhoe), Alexander Dumas, H.G. Wells, Jules Verne, O. Henry, Calumet K, Mickey Spillane, Donald Hamilton, Thomas Wolfe, Balzac, John O’Hara, Frederic Brown, Kafka, The Scarlet Pimpernel, Gone With the Wind, Thomas Mann, Theodore Dreiser, Sinclair Lewis. Hmmm. Looks like pretty much the usual suspects. No doubt Tolstoy and Thomas Wolfe fans are for the high jump, whereas a suitable appreciation of Mickey Spillane will get you an A+. Not that I'm knocking pulp of course. I'm a big Matt Helm fan myself. Update: A couple of anonymous comments insist that there is "absolutely no connection" between the ARI and Founders. I based my post on the facts that long time ARI supporter and writer Gary Hull, as Anonymous put it "designed the core curriculum and teacher training, a brilliant achievement in rational education" in addition to recently stepping down as CEO and Chairman, and who is, according to Founders website, staying on as "Chief of Educational Research and Development with responsibilities for cultivating the faculty, developing the curriculum and teacher training, and maintaining the highest level of academic standards" - something that seems to clash with Anonymous' claim that Hull "has no involvement with the operations of the college whatsoever." Further, Founders' Philosophy Professor Robert Garmong is a regular writer for, and presumably a supporter of, the ARI. Some of his work can be found on the ARI site here, here, and here. Also, Founders Business Professor Steve Gedeon seems to be a member the ARI-supporting Toronto Objectivist Association, an organisation which also carries Founders opening as a news story on its website. We also find that Robert Garmong, and the presumably related Dina Garmong have also contributed articles and "educational lectures and events" here. Additionally, Founders Art History Professor Lee Sandstead is also described here as an "Objectivist Art Historian", who has written for The Intellectual Activist during its ARI-endorsed period. Interestingly, two reviews of Sandstead's writing are the only on-line articles in the archives of, you guessed it, the Toronto Objectivist Association. Sandstead also seems to have personally maintained a chronology of Ayn Rand's life and works, and speaks at events promoted by ARI supporters. Thus we find long term Objectivists, and ARI supporters at that, are at least 50% of the faculty thus far announced, in addition to the college itself being reportedly ARI supporter Gary Hull's "brainchild." Given the extremely small size of the Ayn Rand Institute in the scheme of liberal academia, this composition seems unlikely to be coincidental. We will also leave aside intriguing hints like the makeup of the reading list, and the general tone and rhetoric of the site itself. Thus our anonymous commentator's claim - "There is absolutely no connection between ARI and Founders College" - seems itself highly questionable. But then perhaps this is just another of Objectivism's famous "contextual" absolutes. Their other claim - that we are "labeling the college as ARI-related" and that this is "unfair, unsupported and only serves to marginalize something you have not bothered to research" is therefore likewise. However, in the spirit of open-mindedness, I will add a question mark to the post heading, and rephrase the opening line similarly. And if our anonymous commentators would be prepared to step forward and name themselves, then perhaps we might take their comments a little more seriously. Understanding Objectivist Jargon Pt 12: "Benevolent Universe Premise"
"Benevolent Universe Premise" = The universe is in fact neutral. Thus, success and happiness are metaphysically to be expected. This is because the universe is indifferent to you. If you act in accordance with Objectivism you are certain to achieve your values. Unless there is some kind of accident, in which case, you won't. Hey, that's the universe for you. If this seems to make no sense, just remember that Ayn Rand always thought and wrote clearly and precisely, not like other philosophers. Understanding Objectivist Jargon Pt 11: "Malevolent Universe Premise"
"Malevolent Universe Premise" = the view that the universe is somehow inherently hostile to man. Who exactly holds this odd view, and if this was the case, how man might have survived thus far in what is undoubtedly a cosmically unfair matchup is not clearly explained.